Are you worried about your milk production? That’s a pretty common concern for new moms. No need to stress out, though. We’re here to help. But first, are you sure your milk production is not sufficient? Moms who use bottles to feed their babies know exactly how much they’re drinking. When you’re breastfeeding, not so much. Wouldn’t it be great to have clear breasts with ounce marks on them? Not sure how that would look in a swimsuit, but it would sure make feeding our children a lot less stressful. A number of foods and beverages can help increase your milk production. Learn what to eat and drink while you’re nursing to help with your supply! Does Your Milk Production Really Need Any Help? Is baby peeing 8-10 times a day? If you’re changing diapers faster than you can say, “I feel like all I do is breastfeed and change diapers,” your milk supply is probably fine. Is baby singing to you? Babies make a sweet little noise when they’re drinking that I can’t describe, but every momma knows. It’s a cross between the sound a marathon runner might make when guzzling Gatorade, and a precious, quiet coo. (Just thinking about it makes me smile.) That sound? It’s baby being satisfied. Your breasts are doing exactly what they were built to do. You’re a champion. Any of those sound familiar? Talk with a lactation consultant or your doc. If you want to give it a little boost, there is absolutely nothing wrong with that. 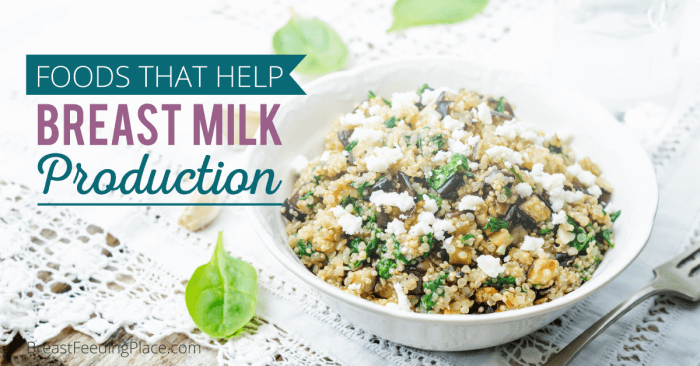 Let’s talk about some things you can eat and drink that will help with your milk production. Eat a balanced diet that provides enough calories. To make sure your milk supply is as nourishing as possible and that you’re making enough for baby, you need to put healthy foods in your body. Doctors and dietitians recommend nursing moms eat from each of the food groups every day. Just a quick reminder, they are: Fruits, Vegetables, Protein, Grains, and Dairy. While it’s tempting to grab a donut or a bag of chips because they’re convenient (and let’s be honest – they taste good), try to avoid them as much as possible. Nature will still work its magic to produce healthy milk for your little one if you enjoy those kinds of treats once in a while, but not every day. Don’t forget that nursing moms need about 500 more calories than they would otherwise. This is not the time to try and restrict calories as it will likely reduce your supply of breast milk. I encourage you to talk to your doctor about how many calories they want you to take in, and what, if anything at all, you should be doing to lose the baby weight. As you might imagine, your body’s need for calcium is increased during pregnancy and while breastfeeding. Of course, you know that yogurt, milk, cheese, and calcium-fortified soy milk or almond milk are good options. Almonds are high in calcium, so are edamame, spinach, kale, and collard greens. Whey protein has lots of calcium as well. Mix it with some kale and fruit and you have a delicious smoothie that’s a perfect way to help increase your milk production. Look for foods naturally rich in zinc. Zinc is vital for breast milk production. Your body doesn’t store it, so you need to make sure you’re replenishing it every day. Try to get about 12 mg a day in your diet. Oysters are the best source of zinc. In fact, a single oyster comes close to giving you all the zinc you need when nursing. Worried about mercury intake in seafood while nursing? This is what the US government wants you to know. Did you know your body can’t make iodine? That’s interesting given that the thyroid needs it to make hormones. A breastfeeding mom needs about 290 mg of iodine a day. Careful, though! Too much iodine can be dangerous. You can likely get what you need in dairy, fruits, vegetables, and iodized salt. Finally, if you remember nothing else from this post, remember to take care of your own body. For moms, most especially new moms, sleep is in short supply. We’ve all been there. You feel like a zombie, so being told you should try to sleep more sounds like the silliest thing you’ve ever heard. Of course, you’d like to sleep more! The fact is that your breastfed baby needs you to be healthy so that she can be healthy. Resting as much as you can is not selfish, nor is it lazy. It’s as crucial for your baby’s well being as it is for your own. You can’t be the best mom you can be if you’re not caring for yourself first. As they say, you can’t pour from an empty cup. 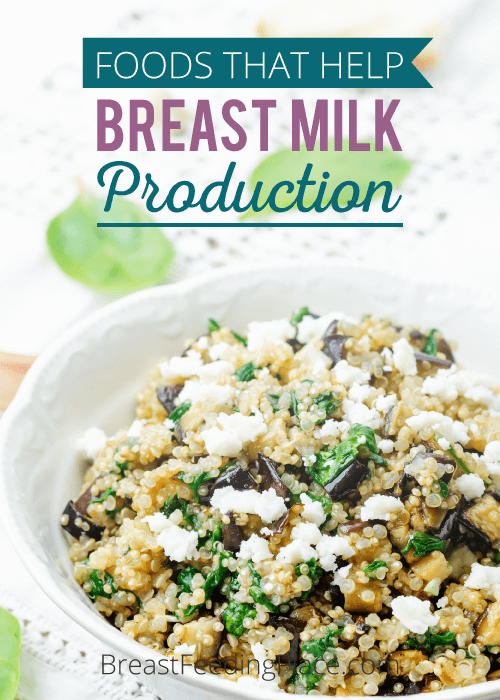 Do you need help getting healthy food while you breastfeed? Go here to find out if you qualify for WIC. Not sure what your rights are as a nursing mom at work? Have other breastfeeding questions or concerns? Call the OWH Helpline at 800-994-9662. They offer breastfeeding peer counselors Monday-Friday, 9-6 EST.